This was by the skin of my teeth. Actually, if we're splitting hairs, I didn't make it. I was knitting right up to the end of break on Friday, and when I finally bound off I didn't have a darning needle so I couldn't even weave in the end, let alone double the brim under and sew it in place, as directed. This is what I get for not reading the pattern properly and assuming it's just a few increase rounds and then a bind off for the brim. I didn't not leave myself enough time on Friday morning. It is a truly fabulous hat, though. Its recipient is already quite tall, and when we made him a cone from an old laminated poster to prop it up, he jigged around the classrooms, dipping to go through doors. Brilliant! It took a whole ball of King Cole Magnum, less about 2 metres, and I curtailed the final red stripe after 8 rows because I could see the end was nigh. It took most of a ball of white Cascade Pacific Chunky but I can't be certain how much exactly. I knitted the small size on 4mm needles which was about right for chunky yarn. 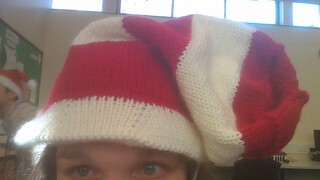 Actually want to knit it again - it is such a fun hat to wear. Here's the pattern in case you're inspired.